In-form Rafael Nadal overcame Tomas Berdych in straight sets to set up an Indian Wells 2013 final match against Del Potro. Fifth seed Nadal entered his fourth final after the long injury lay-off and will be looking to land his first hard court title of the year. He humbled his semifinal adversary Tomas Berdych and thus extended the head-to-head lead to 13-3, defeating his semifinal opponent for the twelfth time in a row. There were no serious threats in the opening set until Nadal obtained a triple break ball at 3-3 and seized the sixth-seeded Czech’s serve with the last one. He held the follow-up service game after a deuce to consolidate the break. Berdych could not upset the Spaniard champion in the final game of the set which Rafa served out with the set point number one after forty-three minutes. The players fought toe to toe in the beginning of the set number two as well until Berdych clinched a break to go 5-3 up. The Czech now served to level the terms, yet Nadal had other plans, built a 40-lead and ultimately prevented his rival to make it one set each. 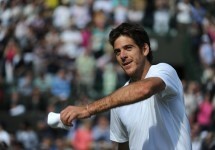 The eleven–time Grand Slam winner Spaniard did not stop there and went on to claim a second consecutive break. A light at the end of the tunnel appeared for Berdych in the twelfth game, but he could not outfox Rafa who fended off all three break point opportunities to complete his second set comeback and celebrate a 6-4, 7-5 triumph after one hour and forty-four minutes of play.